Goaltender Jon Gillies of South Portland has compiled a career record of 58-34-13 to go with a 2.08 goals-against average and .930 save percentage for the Providence College Friars. 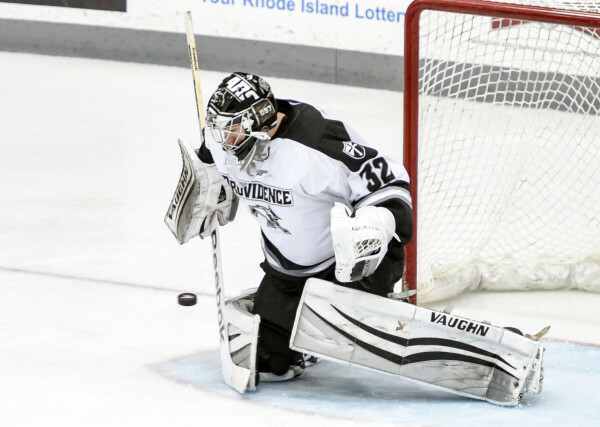 Providence College hockey goalie and South Portland native Jon Gillies may not be your typical college student. He isn’t a “high-end social guy,” according to his coach, Nate Leaman. Fortunately for the Friars, they have received great mileage from the 6-foot-5 goalie. Entering their Frozen Four matchup with the University of Nebraska at Omaha on Thursday at Boston’s TD Garden, Gillies had held 12 of his last 13 opponents to two goals or less. The All-American’s 13 shutouts are the most in the school’s history. He boasts a career record of 58-34-13 go go with a 2.08 goals-against average and .930 save percentage. The junior was the Hockey East Rookie of the Year and the first freshman to earn a spot on the all-league first team and has limited opponents to two or fewer goals in 76 of his 108 starts. He began his career playing for the Casco Bay house mites (ages 8-under) before playing for the Maine Renegades. “My dad made me split between goalie and forward my first year of mites. He didn’t want me to be a full-time goalie,” said Gillies, who noted that his father wanted him to learn how to be a good skater. In his second year of mites it became apparent that the youngster was going to follow in the footsteps of his father, grandfather (Bruce Gillies Sr.), uncle (Chris) and cousin, Jason Braun, who were all goalkeepers. His grandfather played at Norwich University in Vermont, his father tended goal at the University of New Hampshire, uncle Chris played for Denver and Braun donned the gear for Northeastern University. So he received his first set of goalie equipment. The 21-year-old Gillies said his father has had the biggest influence on his career. Gillies wound up playing much of his youth hockey in Massachusetts before returning to play for North Yarmouth Academy’s middle school team and one year for the junior varsity team while also playing youth hockey in Massachusetts. He went to the Salisbury School in Connecticut for another year before landing a spot with the Indiana Ice in the prestigious U.S. Hockey League and eventually signed a National Letter of Intent to attend Northeastern, but when head coach Greg Cronin and his staff left, he reassessed his decision. “Northeastern told me they would release me from my NLI if their goalie, Chris Rawlings, returned to school. He did come back and they kept their word. I’ll be forever thankful to them. It doesn’t happen too often. I was very fortunate they afforded me that opportunity,” Gillies said. Leaman had gone to watch a USHL game involving a couple of his recruits and Gillies played for the other team. Gillies impressed Leaman but was was still committed to Northeastern. “The whole thing [coaching change] went down a couple of weeks later. We weren’t the first school to the punch by any means but I told Jon it was a terrific opportunity for him and he understood that,” said Leaman. Leaman said former NHL great Patrick Roy wanted Gillies to play for his Quebec Remparts of the Quebec Major Junior Hockey League. “I told him he’d be facing 19, 20, 21 and 22 year-olds at this level who could shoot the puck and every team in Hockey East had at least six drafted players. He would be playing big-time hockey, Once he saw that and understood it, Major Junior went away,” said Leaman. Gillies said his teammates have been instrumental in his success. He has allowed more than three goals in a game just 15 times in his 108 starts. “He has been our starter since day one of his freshman year. He is a big-time goalie who gives you a chance to win every night,” said Leaman. “He has really helped our program transition from being one of the worst in the league to one of the better teams in the league. He allows you to get away with making mistakes. “He is big, athletic, he can read the play and he has good instincts,” said Leaman. Leaman said last season was an important year for Gillies because he had had his ups and downs in the World Junior championships and struggled for eight games when he came back because he lost some confidence. “It was the first time he had to encounter adversity. But he did a real good job battling through it. He shut out Quinnipiac in an NCAA Tournament game and that really helped him coming into this year,” said Leaman who noted that the goalie is team-oriented and well-liked by his teammates. Gillies said he has focused on “getting better every year. “I just want to be consistent every night and make sure I do the things I need to do that make me successful,” said Gillies, a third-round draft pick of the Calgary Flames in 2012 (75th overall). Gillies is 8-0-1 in his career against Maine including his first career shutout. He doesn’t harbor any resentment and views Maine as just another opponent. “It doesn’t matter who we play, we just want to get a win. We’ve been fortunate enough to always take care of business against Maine,” said Gillies. Gillies is looking forward to the Frozen Four and said he isn’t giving any thought about whether he will pass up his senior year to sign with Calgary.